Mouser Electronics, Inc., the industry’s leading New Product Introduction (NPI) distributor with the widest selection of semiconductors and electronic components, announces a global distribution agreement with ODU, a leading international supplier of connection systems. 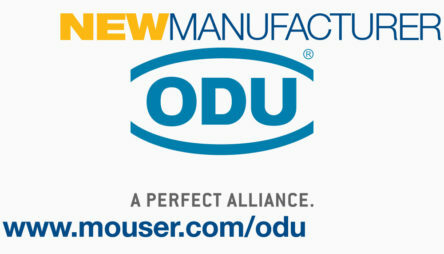 The ODU product line, now available from Mouser Electronics, includes the ODU MINI-SNAP®, ODU MEDI-SNAP®, and ODU MINI-MED® connector series. To learn more, visit www.mouser.com/odu.